University Singers Present Annual Commencement Concert The performance is free and open to the public, and no tickets are required. 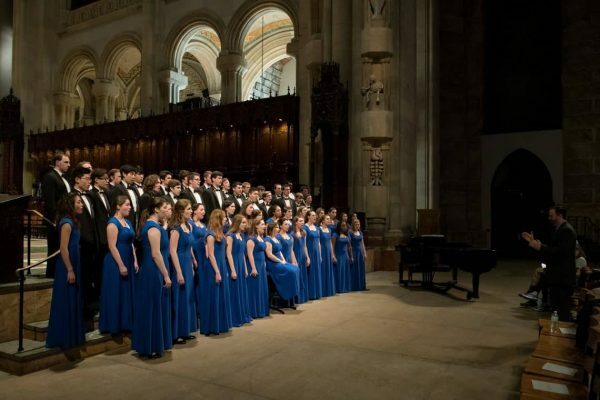 The Washington and Lee University Singers will present a final performance for the academic year under the direction of Shane M. Lynch on May 22 at 8 p.m. in Wilson Concert Hall. The performance is free and open to the public, and no tickets are required. The concert will feature favorite works throughout 2017-2018 selected by the seniors, focusing mainly on highlights from their tour during February Break. While the final selections won’t be made until a few days before the performance, , attendees can most likely expect to hear works by J.S. Bach, Ēriks Ešenvalds, Dan Forrest, Stephen Paulus and, as always, the group will close the concert with “Shenandoah,” arranged by James Erb.